The first time I gave a speech, back in the third grade, I began my lengthy, dysfunctional relationship with anxiety. As you may know if you’ve gone through my Hotshot Speaker video training, my classmates laughed at me, I cried, and I made a pact (that I honored) to play safe and small. Do whatever it took never to feel diminished in front of my peers again. One of the many consequences of my attempts to protect myself from visibility and judgement—increased anxiety. For there was so much I wanted to say, and ultimately, holding it all in created more negative sensation than spitting it out—and occasionally having my words misfire. When we get in front of an audience to speak and share our ideas, be it on stage or even on a sales call with an event organizer or prospective client, we will often be overcome with sensation. It’s signaling we’re in the game. We’re up to something big. We are stepping into our moxie and on the path to leaving the legacy we were put here to make. Shifting from naming and experiencing what we are feeling as anxiety to an opportunity, if I may be so bold, can be a spiritual assignment. One that allows us to reconnect with our voice and mission and transmute our fears into love—and a reinvigorated commitment to serve. Now, you may agree that all sounds great in theory, but you (we!) need tools to turn this idea into reality. My dear friend, author Corinne Zupko, is a licensed counselor and Mindfulness-Based Stress Reduction teacher. She began her study of psychology out of necessity when debilitating anxiety threatened to derail her life. Seeking ways to do more than temporarily alleviate her symptoms, Corinne began to study A Course in Miracles (ACIM), mindfulness meditation, and the latest therapeutic approaches for treating anxiety. As Corinne healed her own mental anguish, she compiled the perception-shifting process she describes into a book, From Anxiety to Love: A Radical New Approach for Letting Go of Fear and Finding Lasting Peace. 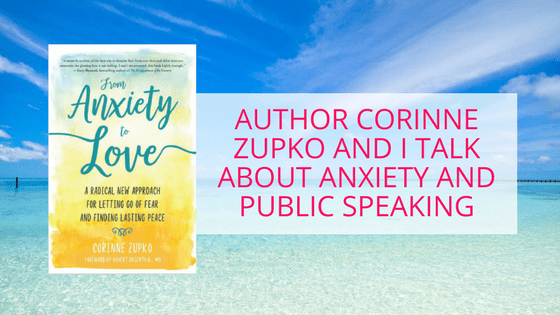 I sat down with Corinne to chat about anxiety—and how to change our relationship to it—whether we are presenting or simply navigating through the everyday stressors of life. Click below to watch our short interview, and be sure to grab a copy (or two or three) of From Anxiety to Love here.